An amoral thief (Jean-Paul Belmondo) kills a policeman and tries to convince his aloof American lover (Jean Seberg) to flee to Italy with him. Jean-Luc Godard “intended his debut film” — which was “inspired by a newspaper item about a young thug who killed a policeman and hid out with his girlfriend, who later betrayed him” — to “merely be an homage to earlier gangster films, but it became the most influential film of the New Wave, an existential masterpiece.” In a deliberate act of cinematic anarchy, Godard “broke all… rules”, failing to use “transition shots between scenes” or “establishing shots or matching shots”, and heavily utilizing “jump cuts both to convey a chaotic atmosphere and to express the reckless nature of his youthful characters”, who “jump through time and space”. Technique aside, Breathless (A bout de souffle, in French) is notable for Godard’s “Paris street photography” (shot by “innovative cameraman” Raoul Coutard, who “was willing to hide in a wheelbarrow for street shooting and to roll along in a wheelchair with the camera in his lap”); Godard’s “score, which mixes jazz and Mozart; [and] his many movie-reference- in-jokes”, among other traits. 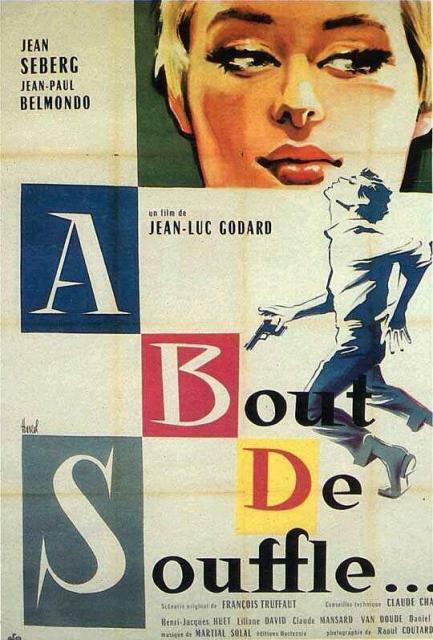 As for the story itself, Peary notes that “alienated French youth” at the time “could identify with Belmondo’s casual lawbreaker and his disloyal girlfriend”, “lovers who act impetuously without regard to consequences”. More mature audiences, however, may find Michel (Belmondo) less a “hero” than simply a shiftless thug who deserves jail time for the murder he so callously commits at the beginning of the film; at the very least, he deserves the cool reception he receives from “beautiful, dimpled Seberg”, who “is his match as the hard-bitten, free-spirited American expatriate who is afraid of commitment and emotionally vacuous”. Seberg — though extremely photogenic (see stills below) — was never a great actress, and her French accent here is so godawful that it’s a major distraction (though to be fair, her reading surely wasn’t helped any by the fact that Godard gave his actors their lines the day of shooting). Her character’s motivations (or lack thereof) are just as enigmatic as Belmondo’s, and thus we never really understand her or relate to her in any depth. While Breathless is far too important cinematically to miss seeing, don’t be surprised if it leaves you strangely cold. Most definitely, as a groundbreaking New Wave classic. Discussed at length in Peary’s Cult Movies 2 (1983). I don’t know… I just can’t use the word ‘must’ here – although I probably should, given the film’s place in cinema history; given the fact of its exponential difference from other films at the time it was made and, by extension, its influence on the future of film in general; shaking things up and all that. That said, I just don’t like it. I’ve tried twice to re-watch it recently before posting this and I just couldn’t get very far into it. That’s me and Godard: a love-hate kind of thing, with much less of the love stuff. I rather like Belmondo as an actor, but even he kind of annoys me here. If Seberg’s part had been played by Anna Karina (who has made more than one Godard film palatable), maybe I’d have a different feeling about the film overall. It’s true: the film does leave you “strangely cold”. I believe I felt that way when I first saw it. I recall, over the years, probably seeing it once or twice again – all the way through. So it’s not as if it didn’t get a fair shake from me. Bottom line: for the sake of cinema history, see it if you feel you must. You’re on your own.